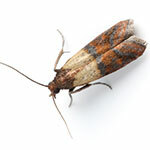 Indian Meal Moth: The adults are poor flyers and will flutter toward bright light especially at night. They will lay eggs in and around the food sources. Treatment should be done as soon as these insects are noticed to avoid extensive treatments later. Indian Meal Moths feed on dried fruits, grains, seeds, nuts, chocolate, bird seed, dog food, powdered milk and many other stored food products.